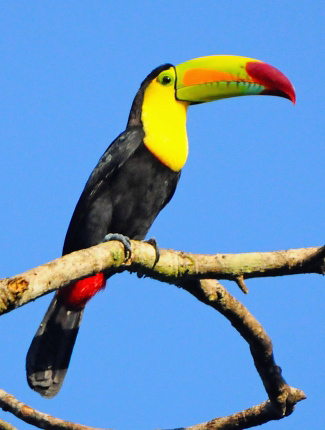 Keel-billed Toucan in Belize by Marie-France Grenouillet. Belize is a tiny country which is easy to cover in two weeks so some tour companies include in their set itineraries the Mayan site of Tikal just across the border in Guatemala, where White-nosed Coatis are confiding and many birds are easier to see, including Ocellated Turkey and Great Curassow. White Hawk by Jon Hornbuckle. Great Curassow, Ocellated Turkey, Orange-breasted Falcon, Yellow-lored Parrot, Yucatan Nightjar, Yucatan Woodpecker, Yucatan Jay and Black Catbird, as well as some of the 100 or so Northern Central American endemics including Rose-throated and Yellow-winged Tanagers, and Black-throated Shrike Tanager. Also a chance of Yucatan Bobwhite and Yucatan Vireo. Crested Guan, Magnificent Frigatebird, Bare-throated Tiger Heron, Boat-billed Heron, Jabiru, Northern Jacana, Double-toothed, Plumbeous, Snail and Swallow-tailed Kites, King and Lesser Yellow-headed Vultures, Great Black, Short-tailed and White Hawks, Bat and Laughing Falcons, Russet-naped (Grey-necked) Wood Rail, Sungrebe, White-fronted Parrot, Mangrove Cuckoo, Vermiculated Screech Owl, Mottled and Spectacled Owls, Northern Potoo, Long-billed and Stripe-throated (Little) Hermits, Green-breasted Mango, Purple-crowned Fairy, Azure-crowned and Rufous-tailed Hummingbirds, Black-headed, Collared, Gartered (Violaceous) and Slaty-tailed Trogons, Lesson's (Blue-crowned) and Tody Motmots, American Pygmy Kingfisher, White-necked and White-whiskered Puffbirds, Rufous-tailed Jacamar, Emerald Toucanet, Collared Aracari, Keel-billed Toucan, Black-cheeked, Chestnut-coloured and Pale-billed Woodpeckers, Dot-winged Antwren, (Mayan) Black-faced Antthrush, Scaly-throated Leaftosser, Rufous-breasted Spinetail, Northern Barred, Ruddy and Tawny-winged Woodcreepers, Eye-ringed Flatbill, Fork-tailed Flycatcher, Red-capped and White-collared Manakins, Green Shrike Vireo, Band-backed and White-bellied Wrens, warblers including Grey-crowned Yellowthroat and Grey-throated Chat, Crimson-collared and Golden-hooded Tanagers, Green and Red-legged Honeycreepers, Botteri’s Sparrow, Montezuma Oropendola and orioles. Also a chance of Spotted Wood Quail, Agami Heron, Crane Hawk, Orate Hawk Eagle, Barred and Collared Forest Falcons, Rufous-necked Wood Rail (Caye Caulker) and Lovely Cotinga, as well as Red-footed Booby (there is a colony of these birds and Magnificent Frigatebirds on Half Moon Caye on Lighthouse Reef Atoll (mid-December to August with chicks usually from March). Bottlenose Dolphin, Yucatan (Black) Howler and Black-handed (Geoffroy's) Spider Monkeys, White-nosed Coati and 'Fish-eating' Bat. Also a chance of West Indian Manatee (on boat trips out of Belize City, to places such as Swallow Caye), Kinkajou and Tayra, and an outside chance of Jaguar (here at its highest density in Central America) and Ocelot. 500 fish species including Whale Shark (Apr-May, usually during full moons when they feed on the annual snapper spawning), Spotted Eagle Ray, Mirrowing Flying Fish and numerous coral reef fish on the 300 km (185 mile) long barrier reef. Also Green, Hawksbill and Loggerhead Turtles (all of which nest on offshore islands May to November), Striped Basilisk Lizard, and a chance of American and Morelet's Crocodiles, and Red-eyed Tree Frog (especially Jun-Jul). Numerous spectacular butterflies including Common Morpho, swallowtails, heliconians and owls. Chan-Chich Crested Guan, Great Curassow, Ocellated Turkey, Bare-throated Tiger Heron, King Vulture, Ornate Hawk Eagle, Sungrebe, Vermiculated Screech Owl, Mottled Owl, Northern Potoo, Yucatan Nightjar, Long-billed Hermit, Purple-crowned Fairy, Slaty-tailed Trogon, Lesson’s and Tody Motmots, Rufous-tailed Jacamar, White-whiskered Puffbird, Keel-billed Toucan, Black-cheeked and Pale-billed Woodpeckers, Dot-winged Antwren, Black-faced Antthrush, Scaly-throated Leaftosser, Red-capped and White-collared Manakins, Green Shrike Vireo, White-bellied Wren, Grey-throated Chat, Black-throated Shrike Tanager, Golden-hooded and Rose-throated Tanagers, Yucatan Howler, Black-handed Spider Monkey and White-nosed Coati. Also a chance of Spotted Wood Quail and Barred Forest Falcon. Duplooy's Jungle Lodge Kinkajou (mostly Jan-May). Also a chance of Tody Motmot. 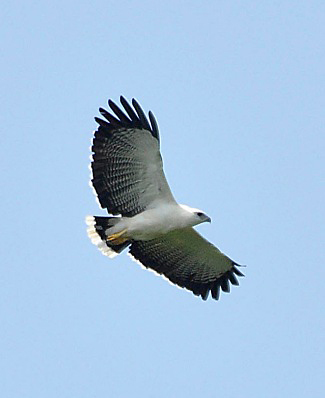 Mountain Pine Ridge Reserve including Slate Creek lookout/raptor viewpoint, Hidden Valley Falls and Thousand Foot Falls – raptors such as Plumbeous and Swallow-tailed Kites, and Great Black and White Hawks. Also a chance of King Vulture and Orange-breasted Falcon (at its Central American stronghold, especially at Thousand Foot Falls). Hidden Valley Inn and Reserve A chance of Tody Motmot. Rio Frio Cave Red-capped Manakin, Slaty-tailed Trogon and Black-throated Shrike Tanager. Caracol, in Chiquibul NP Ocellated Turkey and Keel-billed Motmot. Blue Hole NP/'Hummingbird Highway' hummingbirds such as Purple-crowned Fairy. Also a chance of Great Currasow, Lovely Cotinga and Northern Royal Flycatcher. Cockscomb Basin WS Black Howler Monkey, and Red-capped and White-collared Manakins. Also a chance of Red-eyed Tree Frog (especially Jun-Jul), Kinkajou and Great Curassow, and an outside chance of Jaguar (here at its highest density in Central America) and Ocelot. Kanantik Reef and Jungle Resort A chance of West Indian Manatee (Placencia Lagoon). Jaguar Reef Lodge Area Bottlenose Dolphin, Spotted Eagle Ray, coral reef fish, Magnificent Frigatebird (offshore nesting colony), Keel-billed Toucan, Red-capped Manakin, Collared Aracari and wintering warblers such as Yellow-throated. Pook's Hill Spectacled Owl, Purple-crowned Fairy, Elegant and Slaty-tailed Trogons, Lesson’s Motmot, Black-cheeked Woodpecker, Dot-winged Antwren, Eye-ringed Flatbill and Crimson-collared Tanager. Crooked Tree WS Yucatan Jay, Bare-throated Tiger Heron, Boat-billed Heron, Jabiru, Snail Kite, Black-collared, Crane and Great Black Hawks, Lesser Yellow-headed Vulture, Russet-naped Wood Rail, Northern Jacana, Yellow-lored Parrot, American Pygmy Kingfisher, Yucatan Woodpecker, Yucatan Jay and Rufous-breasted Spinetail. Also a chance of Agami Heron (on boat trips, mostly Jan-May) and Sungrebe. Lamanai (Mayan Archaeological Site) reached via boat along the New River/Outpost Lodge/New Lagoon - Thicket Tinamou, Boat-billed Heron, Jabiru, King Vulture, Double-toothed Kite, Ruddy Crake, Northern Jacana, Mottled Owl, Yucatan Nightjar, Northern Potoo, Black-headed, Slaty-tailed Trogons, Tody Motmot, White-necked and White-whiskered Puffbirds, Pale-billed and Yucatan Woodpeckers, Mayan Black-faced Antthrush, Eye-ringed Flatbill, Red-capped and White-collared Manakins, Botteri’s Sparrow and Yucatan Howler. Also a chance of Great Curassow and Agami Heron. Ambergris Caye Nurse Shark, Spotted Eagle Ray, coral reef fish including big groupers, Reddish Egret and White-crowned Pigeon. Also a chance of West Indian Manatee. Caye Caulker Magnificent Frigatebird, White-crowned Pigeon, Cinnamon Hummingbird, Black Catbird, Yucatan Vireo and coral reef fish. Also a chance of Rufous-necked Wood Rail and Sooty Tern. Drowned Cayes A chance of West Indian Manatee, for example at Swallow Caye, accessible by speedboat from Belize City. Any time during the dry season, which usually lasts from December-January to May, is a good time to visit Belize, with March, when many resident species nest, being the peak month to look for birds, and April-May the best time for Whale Shark. During the wet season most of the rain falls in the south of the country. Peterson Field Guide to the Birds of Northern Central America by J Fagan and O Komar. Houghton Mifflin Harcourt, 2016. Birds of Belize by H Lee Jones. Helm, 2004. A Field Guide to the Birds of Mexico and Northern Central America by S Howell and S Webb. OUP, 1995. ABA Birdfinding Guide: A Birder's Guide to Belize by B Frenz. ABA, 2013. Travellers' Wildlife Guides: Belize and North Guatemala by L Beletsky. Arris Books, 2005. Diving and Snorkeling Guide: Belize by T Rock. Lonely Planet, 2007 (Fourth Edition). Many trip reports, some for Belize, are posted on the websites listed here. On some of these websites some reports are independent and some are posted by tour companies who organize tours to Belize. These tour companies and others also post their own reports on their websites, which are listed under 'Some Organized Tours to Belize' below. Tour companies who run organized tours or can arrange custom tours to Belize include the following.